Image by William Warby under creative commons licence. 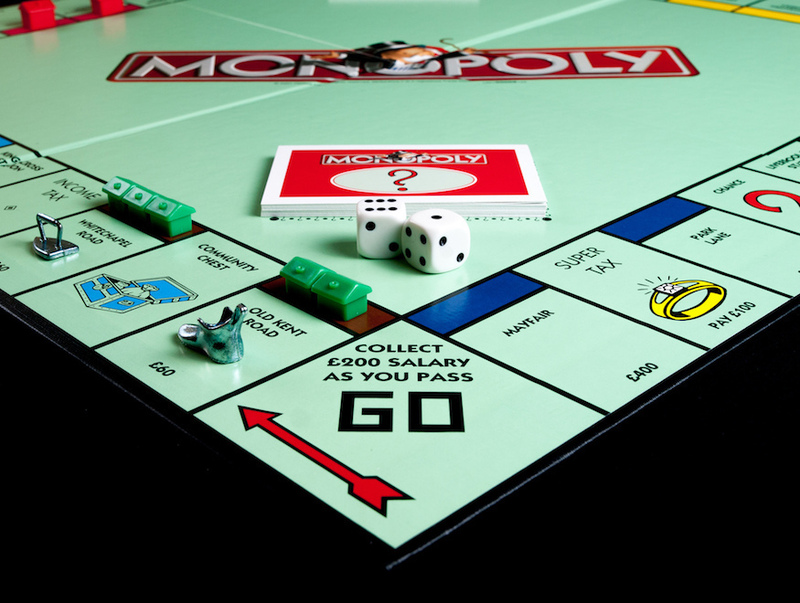 The London Monopoly board is one of the many icons of our city, familiar to millions. We're used to neat little blocks of colour arranged round a board like houses in a Bloomsbury square. But what would it look like spread out over a map of London — a geographic Monopoly? Use the zoom controls for better resolution. It's immediately clear that the board is heavily skewed to the West End. The only property south of the river is Old Kent Road, while Whitechapel Road is the sole nod to east London. 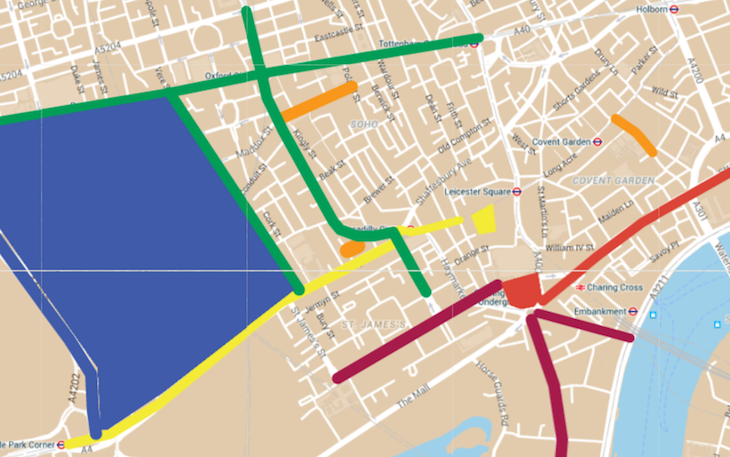 Some of the streets are grouped together by locality — Pentonville Road, Euston Road and (only pub on the board) The Angel Islington all grace the same part of town. Other properties were clustered thematically. The orange squares, for example — Vine Street, Marlborough Street and Bow Street — were all locations associated with the law. Speaking of which, we've left off the Jail — it's not clear which of London's many lock-ups is intended, although it's tempting to plump for Pentonville, given that it shares its name with one of the light blue properties. Then again, it's actually a mile or so distant. The Tower of London might fit the bill, and is still closer to existing properties on the board. We've also left off the utilities for similar reasons. Had we included them, we'd have chosen Battersea Power Station (electricity) and the former New River company (water) at Sadler's Wells. It's possible to walk 2.6km from St James's Palace to Ludgate Circus without leaving the Monopoly board. You could walk still further if you traipsed up and down the Mayfair grid system. Three squares on the Monopoly board do not technically exist. Bond Street is really New Bond Street or Old Bond Street. The Angel, Islington was a famous old coaching inn. It's long gone, although a branch of Wetherspoon's now trades under the name, so it half exists. Finally, Marlborough Street is properly called Great Marlborough Street. Similar maps exist elsewhere on the web, most created by people intending to complete the famous Monopoly pub crawl (a half in a pub on every property). For a thorough exploration of why this particularly idiosyncratic set of properties were chosen, we can heartily commend Tim Moore's classic book on the subject, Do Not Pass Go. We've spent years looking, but have still to find Free Parking in London.